No fewer than 53 press conferences were held on the first day of the Frankfurt Motor Show, one of which proved so popular that they almost had to lock the doors of the Frankfurt Festival Hall. Fifty camera teams were on hand at the Mercedes-Benz press gathering to record the moment when the latest supercar from Affalterbach would be driven onto the stage – the Mercedes-Benz SLS AMG. For AMG boss Volker Mornhinweg, it was an emotional moment which left him struggling for words: "The whole team has been working really hard on this project for the past three years, so it's just a fantastic feeling to be presenting the vehicle to a worldwide audience here at the Frankfurt Motor Show. I won't try to hide just how proud we are of what we have achieved." 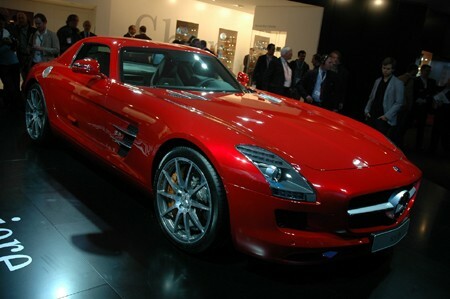 Since 11am on Tuesday, the red SLS AMG has been the centre of attention in the Mercedes hall. Camera crews have been queuing up to film the car from inside and outside, while photographers have been prostrating themselves to capture the full visual effect of the distinctive front end or chunky rear. The SLS is a real beauty. So much so that even Daimler CEO Dieter got a little carried away when the supercar rolled onto the stage shrouded in mist and illuminated by flashing cameras: "For someone like me who has petrol flowing in their veins, the fascination of a vehicle such as this is quite irresistible. It's a fantastic new product that obviously fills me with immense pleasure and pride: I also think it has been attractively presented." If you're one of those people for whom the new Mercedes-Benz SLS AMG is a must-have, you're in for a long wait: the first SLS isn't due for delivery until 27th March 2010.